Nemo and his girlfriend have made a nest on the observatory windowsill to the delight of visiting children. Okinawa has a reputation of having one of the best underwater world off its shores, but everyone is not a diver, and some people don’t even like to swim. The observatory has round portholes on all sides. 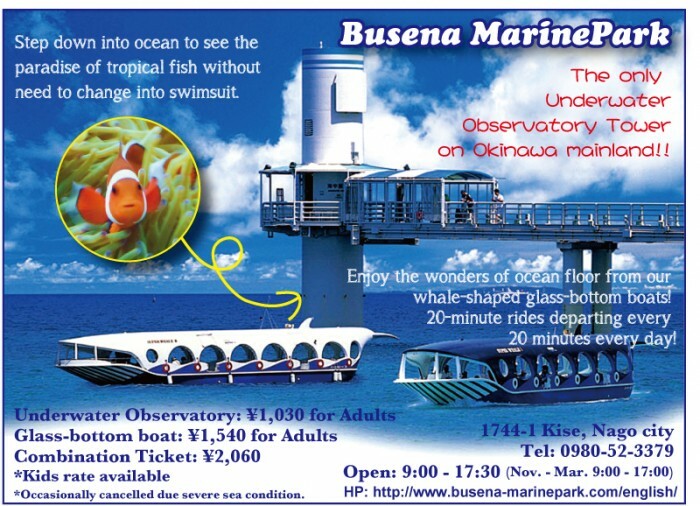 For those, the Busena Marine Park, a part of the Busena Resort area south of Nago, offers a chance to observe marine life from the Underwater Observatory that features a panoramic 360-degree underwater view through its 24 round windows. Even when bad weather hampers a visitor’s stay on Okinawa, one can watch the beautiful underwater life of the Okinawan ocean here. Whale-shaped glass bottom boats that operate from a pier next to the entrance to the causeway leading to the observatory provide exciting close-up views of porcupine, clown and lion fish, anemones and other tropical sea life in the area! 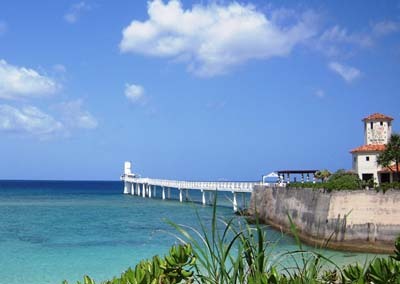 The Busena Marine Park is located at Kise, Nago City. A long causeway leads to the observatory tower. The park has a large free parking area for about 200 cars next to the park entrance from Highway 58. From thee, a free red shuttle bus takes visitors to the glass-bottom boat pier and the walkway to the underwater observatory tower. Or one can take a 10-minute walk to the boat pier. Another five-minute walk takes the visitor to the observatory. The underwater observatory tower is the only one on Okinawa and has been in business for 45 years. Busena Marine Park Business manager Takato Uema says, “We take care of it very well because it would rust easily in its salty environment.” That explains why it doesn’t look anything like 45-year-old. 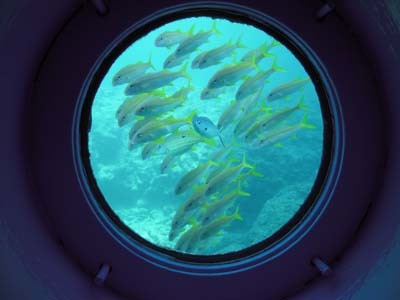 There are 50 steps to down the stairs to the observation platform that has round portholes on all sides, from which to see the underwater life. 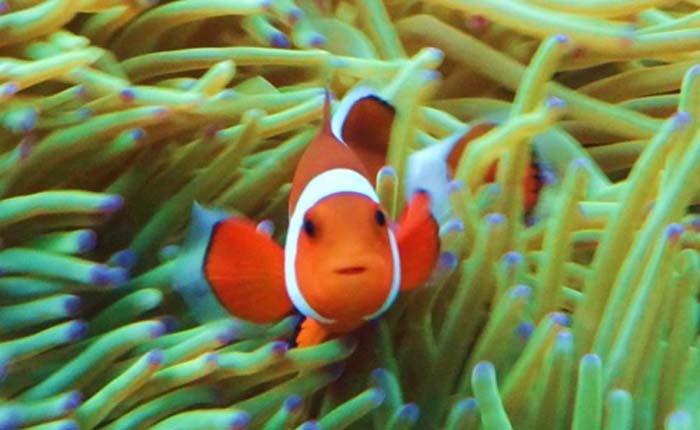 There are many kinds of fish, including clownfish, which is the favorite of all kids from the film “Saving Nemo”. The tower has room for 24 people at a time. The observatory is open from 09:00 to 18:00 from April to October with the last admission at 17:30. It close half an hour earlier during the winter season from November to March. Two whale-themed glass bottom boats operate every day. The glass-bottom boats operate every day when sea conditions allow. There are two boats, one white and the other black, both styled like whales. They both take off at the same time, and each can accommodate 36 persons. The ride takes about 20 minutes. 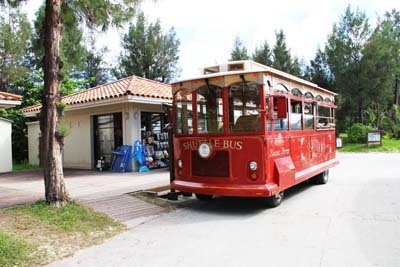 A red shuttle bus styled after an old street car takes visitors from the parking area to the Marine Park. During the boat ride, one can purchase feed for the fish for ¥100. The fish follow the boat because they know people riding the boat feed them. The boat rides start at 09:10 and the last boats take off at 17:30 from April through October. Rides in the wintertime stop 30 minutes earlier than last boat for November through March. Admission to the underwater observatory tower is ¥1,030 for adults, ¥820 for high school and college students, and ¥520 for children age 4 to junior high school students. 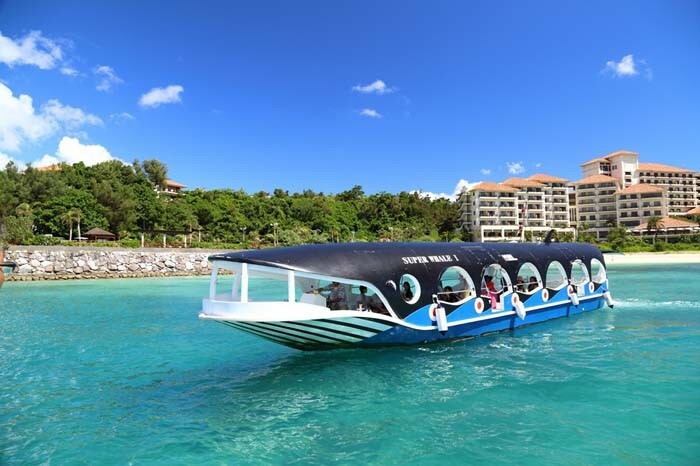 Glass-bottom boat rides cost ¥1,540 for adults, ¥1,230 for high school and college students, and ¥770 for children age 4 to junior high school students. Combined tickets for observatory and boat ride are ¥2,060 for adults, ¥1,650 for high school and college students, and ¥1,030 for children age 4 to junior high school students. A 20% discount is available to SOFA status persons with an official ID. All fees must be paid in Japanese yen, cash only.